Deere & Company, which has become known as John Deere, was founded in 1837 and has since become an industry leader in the production of farming and landscaping equipment. Each model of tractor produced by John Deere is assigned a unique number, rather than an actual name. Identifying the model of your John Deere tractor is important for proper maintenance and when ordering replacement parts. It is also essential to know the tractor’s model number if an insurance policy is to be taken out on the tractor, or to help police recover the tractor should it be stolen. 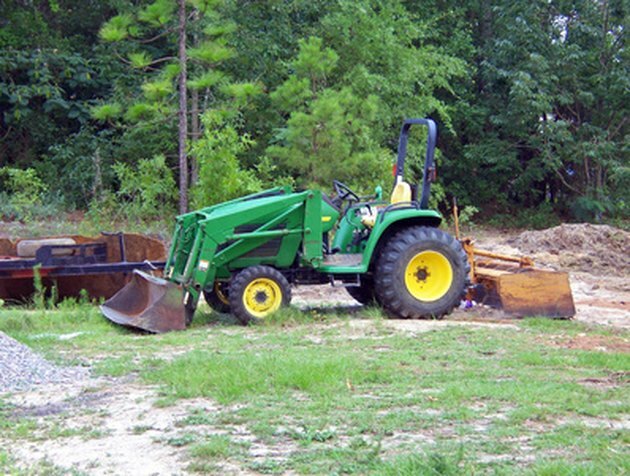 John Deere tractors are almost always identifiable by their solid green paint job with yellow highlights. Look at the hood of the tractor. Many newer model John Deere tractors will have a yellow stripe on the hood with the words “John Deere” written, as well as a three or four-digit number. The number represents the model of the tractor. Look for the serial number plate on the rear of the tractor should the numeric model number not appear on the hood. The plate will be metallic and will be attached to the tractor with rivets. The model number will appear above the serial number, which is a 13-digit figure, beginning with a letter and ending with six numbers. Look under the right fenders for the serial number plate, should it not be affixed to the rear of the tractor. This is the location of the serial number plate on older model tractors.